A novel splice variant of RGS 9 was isolated from a rat hypothalamus, human retina, and a human kidney (Wilm’s) tumor. This variant, termed RGS 9L, differs from the retinal form (termed RGS 9S) identified previously in that it contains a 211- (rat) or 205- (human) amino acid proline-rich domain on the carboxyl terminus. The pattern of RGS 9 mRNA splicing was tissue specific, with striatum, hypothalamus- and nucleus accumbens expressing RGS 9L, whereas retina and pineal expressed RGS 9S almost exclusively. This pattern of mRNA splicing seemed to be highly conserved between human and rodents, suggesting cell-specific differences in the function of these variants. Transient expression of RGS 9L augmented basal and β-adrenergic receptor-stimulated adenylyl cyclase activity while suppressing dopamine D2receptor-mediated inhibition. Furthermore, RGS 9L expression greatly accelerated the decay of dopamine D2 receptor-induced GIRK current. These results indicate RGS 9L inhibits heterotrimeric Gi function in vivo, probably by acting as a GTPase-activating protein. The human RGS 9 gene was localized to chromosome 17 q23–24 by radiation hybrid and fluorescent in situ hybridization analyses. The RGS 9 gene is within a previously defined locus for retinitis pigmentosa (RP 17), a disease that has been linked to genes in the rhodopsin/transducin/cGMP signaling pathway. Desensitization is a nearly universal feature of transmembrane signaling systems, and various mechanisms have evolved that serve to dampen intracellular signals in the face of persistent extracellular stimulation. Until recently, the large body of research examining G protein-mediated signaling pathways focused mainly on involvement of receptor phosphorylation and sequestration in the desensitization process. However, a new class of regulators, termed RGS, has been identified recently that influence this pathway at the level of Gα subunits (Dohlman and Thorner, 1997; Berman and Gilman, 1998). Members of the family share a domain (termed RGS domain) that serves to accelerate the intrinsic GTPase activity of Gα subunits, thereby greatly limiting the duration of their activity. Outside of the RGS domain, however, members of the family are structurally diverse and can contain additional motifs that could mediate subcellular targeting, assembly, or both of signaling complexes. Additionally, certain RGS family members exhibit highly restricted patterns of expression, implying cell-specific functions. The expression of RGS mRNAs in the central nervous system has been recently examined, and one family member, RGS 9, was found to be expressed almost exclusively in brain regions that receive dense dopaminergic innervation (Gold et al., 1997; Burchettet al., 1998; Thomas et al., 1998). Moreover, a single dose of amphetamine, which releases endogenous dopamine, greatly reduces expression of RGS 9 mRNA (Burchett et al., 1998). At the time these observations were made, full-length RGS 9 had not been isolated. We therefore sought to clone RGS 9 cDNA to characterize its molecular and biochemical properties. This work, along with the recent cloning of retinal RGS 9 (He et al., 1998), demonstrates the existence of large and small RGS 9 isoforms that are generated by alternative RNA splicing. These splice variants show strong tissue-specific expression that is conserved between humans and rats. Transient heterologous expression of RGS 9L indicates that it suppresses Gi-mediated signaling in vivo, probably by acting as a GTPase activating protein. Cloning of rat and human RGS 9. Standard molecular biological techniques were used for cloning procedures (Sambrooket al., 1989). A partial rRGS 9 cDNA (Burchett et al., 1998) was used to design primers for PCR-based enrichment of RGS 9 clones from a rat hypothalamic mammalian expression cDNA library. Enriched fractions containing 103 colony-forming units were then screened by standard colony lift hybridization using the partial rRGS 9 cDNA as a probe. The obtained cDNA (p374) was sequenced on both strands by the dideoxy-chain termination technique. Sequence from the rRGS cDNA was used to perform a BLAST search of the NCBI expressed sequence tag data base (dbEST). Two clones that share high homology with the 3′ nontranslated sequence of rRGS9 were identified. Restriction analysis indicated that one EST, AA653129(IMAGE Consortium; American Type Culture Collection, Rockville, MD), contained a 3-kb insert that was likely to be full length. Of the 3′ end, 1.6 kb was subcloned and sequenced; however, the 5′ end of this clone could not be sequenced due to a large inverted repeat that seemed to be a cloning artifact. To obtain the 5′ end of human RGS 9, RACE was performed on retinal cDNA (Marathon Ready; Clontech, Palo Alto, CA). 5′ RACE products were sequenced directly and after cloning. To further verify the sequence of the long RGS 9 isoform, the entire coding sequence was amplified from retinal cDNA, and the resulting PCR product was sequenced directly (primer sequences available on request). Recently described RGS 9 cDNAs isolated from bovine and murine retina (He et al., 1998) encode proteins that are ∼200 amino acids smaller than the rat and human cDNAs we obtained, indicating the existence of RGS 9 splice variants. RT-PCR was used to isolate a partial cDNA encoding the small (retinal) form of RGS 9 from rat eye cup RNA. The forward and reverse primers were GAAGCCTGTGAGGATCTGAAGTATG and AGGAGGCAGCTCCTTTTTGAGTTG, respectively. The amplified cDNA was cloned into pGEM 7Z, and sequence analysis demonstrated it to be the rat ortholog of the retinal isoforms described previously (He et al., 1998). This construct (p403) was linearized withHhaI and then used to generate a riboprobe for nuclease protection analysis. Because the probe spans the alternatively spliced exon and includes 233 nt of common sequence, it allows quantification of the large and small forms of rRGS 9 (termed RGS 9L and RGS 9S, respectively) in a single sample. To evaluate the expression of these variants in human brain, a 497-bp EcoRI/SphI fragment of AA653129 was subcloned into pGEM 7Z. This construct (p385) was linearized with HinfI, and the 250-nt riboprobe generated from this construct spans the alternatively spliced exon, allowing detection of both forms. To evaluate expression of RGS splice variants in human retina, 3′ RACE was performed on retina cDNA (Marathon Ready) with the oligonucleotide AATCTCCGATCTATAAGGACATGCTG as the forward primer and AP1 primer (Clontech) as the reverse primer. Because these primers are common for the large and small splice variants present in the cDNA, both subtypes are amplified by this technique. The relative abundance of the subtypes in the RACE products then was determined by nuclease protection analysis using 1% of the amplified material. Nuclease protection analysis was performed as described previously (Granneman et al., 1997). Male Sprague-Dawley rats (250 g; Hilltop, Scottdale, PA), maintained in a controlled environment with free access to food and water, were killed by decapitation. Human tissues were obtained at necropsy from neurologically normal subjects from the Office of the Wayne County Medical Examiner. Tissues were frozen as blocks for later processing for in situ hybridization experiments using a previously published protocol (Bannon and Whitty, 1997). [35S]CTP-labeled antisense cRNA probes were derived from rat (Burchett et al., 1998) and human (p385) RGS 9 cDNAs. Specificity of hybridization signal was established by competition with 1000-fold excess unlabeled probe. Rat RGS 9L (in pcDNA3) or empty vector were transiently transfected into 293T cells along with cDNAs encoding rat β1-AR and human dopamine D2-long receptors, as described previously (Granneman et al., 1997). Two days later, cells were washed and collected by gentle trituration for testing in cAMP accumulation assays (Granneman et al., 1998). Briefly, cells (∼5 × 104/well) were preincubated for 20 min in Ham’s F-12 medium containing 1 mm isobutylmethylxanthine. All cells were treated with 1 μm ICI 118551 to block endogenous β2-AR and then exposed to 20 nm isoproterenol to stimulate transfected β1-AR in the presence or absence of the D2receptor agonist quinpirole (1 μm). Reactions were stopped after 7.5 min, and accumulated cAMP was determined by protein binding assay (Brown et al., 1971). To reconstitute a dopamine-mediated electrophysiological response, G protein-activated potassium channel subunits (GIRKs 1 and 2, Doupniket al., 1997) were transfected into CHO cells expressing constitutively the dopamine D2 receptors. In a few cases, GIRKs and D2 receptors were also cotransfected into native CHO cells. To test the effect of RGS 9L, we compared currents induced by the D2 agonist quinpirole (10 μm) on cells cotransfected with RGS 9L and GIRKs (and D2 receptors when needed) with those seen in cells transfected with only GIRKs (and D2receptor when needed). In some experiments, we transfected RGS4 rather than RGS9 as a positive control. In all of these experiments, an expression vector encoding green fluorescent protein was used to mark successfully transfected CHO cells. GIRK currents were recorded using standard whole-cell recording techniques. Patch electrodes (3–5 MΩ) were filled with a standard intracellular recording solution containing 130 mmKMeSO4, 5 mm KCl, 1 mmMgCl2, 1 mm EGTA, and 5 mm HEPES, pH 7.3. Cells were continuously perfused with an extracellular recording solution containing 111.5 mm NaCl, 30.4 mm KCl, 1.8 mmCaCl2, 0.53 mmMgCl2, and 5 mm HEPES and voltage clamped at −90 mV. Quinpirole was administered using a fast perfusion system (Warner Instruments) that produced solution exchanges with a time constant <100 msec as determined by changing extracellular potassium concentration outside the cell during the experiment. Under our recording conditions, D2 receptor-mediated current were inward. Chromosomal localization of human RGS 9. FISH was performed on chromosomal slides prepared from synchronized human lymphocytes (Heng et al., 1992) using a 3-kb biotinylated probe derived from AA653129. FISH signals and the DAPI-banding pattern were recorded separately; assignment of the FISH mapping data with chromosomal bands was achieved by superimposing FISH signals with DAPI-banded chromosomes (Heng and Tsui, 1993). Molecular cloning of rat and human RGS 9. A partial rRGS 9 cDNA was used to isolate a 2.4-kb cDNA that encodes a protein of 677 amino acids (Fig. 1). A BLAST search of the NCBI expressed sequence tag database (www.ncbi.nlm.nih.gov/) with the rRGS 9 sequence was used to identify potential clones encoding human RGS 9. One clone, AA653129 derived from a Wilm’s tumor, was isolated and characterized by restriction analysis and sequencing. Because technical difficulties prevented complete sequencing of 5′ end of this clone, 5′ RACE was performed to complete the human sequence. To further verify the human sequence, the entire coding block of human RGS 9 was amplified from retinal cDNA and sequenced directly. Human RGS 9 cDNA encodes a protein of 674 amino acids (Fig. 1). Alignment of rRGS 9L (RRGS 9) and human RGS 9L (HRGS 9) amino acid sequences. Single overline, DEP domain. Double overline, RGS domain.Bold, polyproline domain that is unique to RGS 9L. GenBank accession numbers for rat and human RGS 9L cDNAs are AF071475and AF071476, respectively. Overall, the rat and human proteins are 91% identical and 95% similar (Fig. 1). RGS 9 contains three conserved protein domains. Like other members of the RGS family, rat and human RGS 9 contain a highly conserved RGS domain that mediates G protein interactions (Watsonet al., 1996; Facrobert and Hurley, 1997). Indeed, this domain of RGS 9 has been shown to be sufficient to accelerate GTPase activity of Gt (He et al., 1998). This domain is most closely related to that of RGS 11, although the function of that subtype is not known. The amino terminal contains a 76-amino acid DEP (disheveled, egl 10, pleckstrin) domain that has been observed in certain RGS-containing proteins including mammalian RGS 7 andC. elegans egl 10, as well as in unrelated signaling proteins (Ponting and Bork, 1996). The function of this domain is not understood, but it could serve as a means for the subcellular targeting, assembly, or both of signaling proteins. The carboxyl-terminal 200 amino acids of RGS 9 contain a domain that is highly enriched in proline and serine residues. This domain is reminiscent of proteins that bind SH3 and WW domains and suggests that this domain is involved in protein/protein interactions (Lim et al., 1994; Staub and Rotlin, 1996). As detailed below, this domain is absent in the predominant RGS 9 subtype expressed in retina (Heet al., 1998), suggesting this domain might be important in neuron-specific functions. Northern blot andin situ hybridization analyses have demonstrated that RGS 9 is expressed in discrete regions within the central nervous system (Gold et al., 1997; He et al., 1998). Because certain hereditary diseases have been linked to brain regions that express RGS 9 (Wszolek et al., 1992; Dryja and Li, 1995;Chatterjee et al., 1995), it was of interest to determine its chromosomal localization in humans. Radiation hybrid analysis of the Genebridge 4 panel localized human RGS 9 to the long arm of chromosome 17, ∼4.5 cR from WI-5110. Two-point maximum likelihood analysis of the Stanford G3 panel placed RGS 9 at SHGC-30967. Both markers have been placed ∼86 Mb from 17 pter. The localization to the long arm of chromosome 17 was confirmed with FISH analysis, which placed hRGS 9 at 17q23–24 (Fig.2). Chromosomal localization of human RGS 9 by FISH. FISH image signal on chromosome 17 (left) with schematic depiction of chromosome 17 indicating location of fluorescent signals relative to cytogenetic bands (right). Alternative splicing of RGS 9. While undertaking characterization of rat and human RGS 9, He et al., (1998)reported the isolation of mouse and bovine RGS 9 from retina. These retinal forms of RGS 9 are highly similar to the first 467 and 470 amino acids, respectively, of the rat and human sequence reported here (Fig. 1). Thereafter, the nucleic acid sequence diverges dramatically, indicating that RGS 9 is alternatively spliced to encode large (RGS 9L) and small (RGS 9S) forms. This hypothesis was confirmed by RT-PCR amplification and sequencing of a partial RGS 9 cDNA isolated from rat eye cup RNA. Like the RGS 9L, RGS 9S contains the DEP and RGS domains but completely lacks the 200-amino acid proline-rich domain that constitutes the carboxyl-terminal third of the RGS 9L protein. Tissue distribution splicing pattern of RGS 9 mRNA. Northern blot analysis indicated that RGS 9 expression was limited to the central nervous system, where mRNA species of ∼2.5 and ∼9 kb were observed (Fig. 3, top). The 9-kb mRNA species was greatly enriched in pineal and retina (not shown), tissues that express genes of the phototransduction pathway (Blackshaw and Snyder, 1997), whereas the 2.5-kb band was enriched in brain regions innervated by dopamine neurons (e.g., striatum and nucleus accumbens). This pattern of expression indicates that RGS 9L and RGS 9S are encoded by the 2.5- and 9-kb mRNA species, respectively. The precise nature and proportion of the RGS 9 splice variants therefore were examined by nuclease protection analysis using probes that span the alternatively spliced exon and thus allow simultaneous detection of RGS 9L and RGS 9S mRNAs. As shown in Fig. 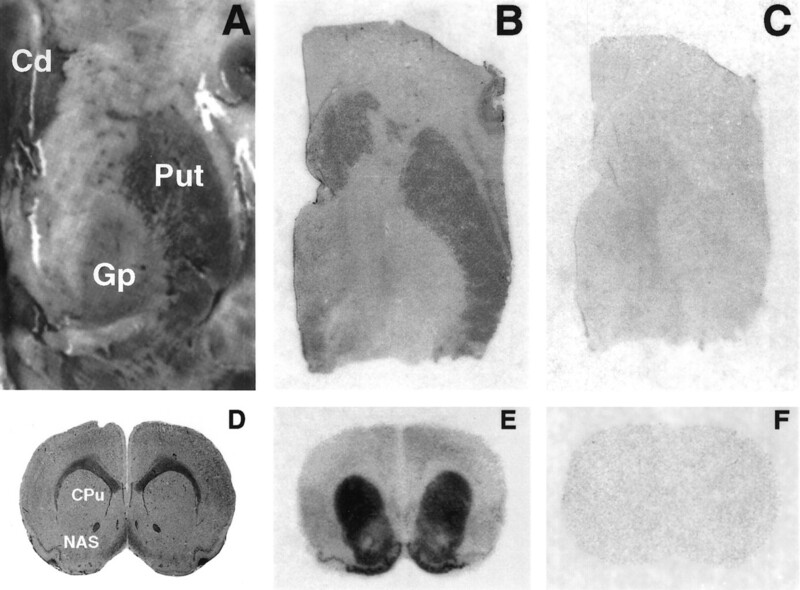 3(bottom), the pattern of RGS 9 mRNA splicing in rat brain was strikingly tissue specific. RGS 9 mRNA within rat brain (hypothalamus, striatum, nucleus accumbens) was nearly exclusively of the RGS 9L form. On the other hand, RNA from eye cup (retina) and pineal gland contained predominantly the RGS 9S mRNA form. Tissue distribution and splicing pattern of rRGS 9 mRNA. Top, Northern blots of several rat tissues probed with rRGS 9 cDNA. Left, location and size (in kb) of mRNA standards. Bottom, Distribution of RGS 9 splice variants in rat central nervous system. RGS 9 mRNA splice variants were characterized by nuclease protection analysis using a probe fully complementary to RGS 9S and partially complementary to RGS 9L, as detailed in Materials and Methods. STD, RNA size standards. The distribution of RGS 9 gene expression and pattern of mRNA splicing within human tissues also was examined. Fig.4 illustrates nuclease protection analyses showing high levels of expression within the caudate and putamen, more modest expression within hypothalamus and nucleus accumbens, very low expression in cerebellum, and an absence of RGS 9 mRNA within the globus pallidus and cingulate cortex. Within each human brain region, as in the rat, RGS 9L was the predominant mRNA form, whereas RGS 9S predominated in pineal gland Furthermore, nuclease protection analysis of 3′ RACE products amplified from human retinal cDNA (necessitated by the unavailability of retinal tissue) revealed a pattern of expression remarkably similar to that seen in pineal gland (Fig. 4, left). Tissue distribution of RGS 9 splice variants in human central nervous system. RGS 9 mRNA splice variants were characterized by nuclease protection analysis in 10 μg of total RNA using a probe fully complementary to RGS 9L and partially complementary to RGS 9S, as detailed in Materials and Methods. Previous work indicated that RGS 9 is abundantly expressed in forebrain regions receiving dopamine innervation (Gold et al., 1997;Burchett et al., 1998). In situ hybridization histochemical analyses (Fig. 5, D–F) revealed a gradient of RGS 9 mRNA abundance within the rat basal ganglia, with the highest abundance found within the dorsolateral aspects of the caudate and putamen and the lowest abundance found within the core region of the nucleus accumbens. In human basal ganglia, in situ hybridization experiments (Fig. 5, A–C) revealed a rather uniform distribution of RGS 9 mRNA within the human caudate and putamen and the absence of RGS 9 mRNA within the globus pallidus, which is in agreement with the corresponding nuclease protection data (Fig. 4). As can be seen, the tissue-specific distribution of expression and pattern of RGS 9 mRNA splicing is conserved from rat to human. Localization of RGS 9 mRNA in human and rat basal ganglia by in situ hybridization histochemistry. A and D, Photographs labeled to indicate nuclei within human and rat basal ganglia, respectively. Cd, caudate;Put, putamen; Gp, globus pallidus;CPu, caudate/putamen; NAS, nucleus accumbens. B and E, Autoradiographs demonstrating the distribution of RGS 9 mRNA within human and rat basal ganglia. C and F, Adjacent sections incubated with radiolabeled RGS 9 probe in the presence of excess unlabeled probe, demonstrating the specificity of the hybridization signal. A truncated RGS 9-GST fusion protein recently was shown to accelerate GTPase activity of Gt (transducin), and it has been proposed that RGS 9S plays a key role in the rapid desensitization kinetics observed in photoreceptor signal transduction. Gt is not expressed in striatum; thus, it is likely that the RGS 9L targets related G proteins in the striatum. We therefore examined whether RGS 9L could influence the activity of Gi proteinsin vivo. For this purpose, 293T cells were transiently transfected with rat β1-ARs and human dopamine D2 receptors in addition to empty vector (pcDNA3), rRGS 9L, or human RGS 4. In cells transfected with β1-ARs and dopamine D2 receptors alone, the β-AR agonist isoproterenol stimulated cAMP, whereas the D2 receptor agonist quinpirole inhibited that activity (Fig. 6). Transfection with RGS 4, which is known to interact with Gi (Watsonet al., 1996; Tesmer et al., 1997), greatly increased basal cAMP accumulation to the point that further stimulation by β-AR activation was modest. Furthermore, isoproterenol-stimulated activity was not suppressed by D2 receptor stimulation. Expression of RGS 9L also significantly increased basal (p < 0.04) and isoproterenol-stimulated (p < 0.01) activities. Furthermore, RGS 9L expression abrogated D2 receptor inhibition of cAMP accumulation. Although expression of either RGS 9 or RGS 4 prevented D2 receptor-mediated suppression of adenylyl cyclase, RGS 4 seemed to increase basal and stimulated accumulation to a greater degree. Whether this difference can be explained by differences in expression levels or activity is not known. In any event, these results strongly indicate that RGS 9L modulates cAMP signaling through interactions with Giproteins. Effect of RGS 9L and RGS 4 expression on stimulation and inhibition of adenylyl cyclase in 293T cells. Cells were transfected with β1-ARs and D2 dopamine receptors along with pcDNA 3 (empty vector control), rRGS 9L, or human RGS 4. Accumulation of cAMP was determined under basal conditions and after stimulation of β1-ARs with isoproterenol (20 nm) in the absence or presence of the D2 agonist quinpirole (1 μm). Values for five independent experiments were each normalized to responses obtained to isoproterenol in control cells. RGS 9L expression augmented basal (p < 0.04) and stimulated activity (p < 0.01) and prevented inhibition by D2 receptor activation. RGS 4 expression greatly increased basal activity (p < 0.05) and blocked D2 receptor-mediated suppression of cAMP accumulation. Values are mean ± standard error of five experiments. To examine the effects of RGS 9L on dopamine-mediated electrophysiological responses, we reconstituted the D2 receptor-mediated activation of inwardly rectifying potassium channels (GIRK) in CHO cells. This response represents one of the better understood electrophysiological effects of dopamine in the brain (Lacey et al., 1987, 1988). As illustrated in Fig. 7, administration of the selective dopamine D2 receptor agonist quinpirole elicited an inward current by activating potassium channels composed of GIRK1 and GIRK2 subunits (Doupnik et al., 1997;Saitoh et al., 1997). Cotransfection with RGS 9L greatly accelerated the decay of this current but did not change its amplitude (control, 2.06 nA; RGS 9L, 2.46 nA; p = 0.68). The time constant for the decay under control conditions was 29.8 ± 7.1 sec (mean ± standard error, seven cells tested) and was reduced to 11.8 ± 3.6 sec after transfection with RGS 9L (eight cells tested, p < 0.02; Fig. 7). A similar acceleration in the decay of the D2 receptor-mediated current was seen after transfection with RGS 4 (two cells tested, not shown). Effect of RGS 9L on the dopamine D2receptor activation of inwardly rectifying potassium (GIRK) currents.Top left, current elicited by a 5-sec application of quinpirole (10 μm) in CHO cells expressing D2dopamine receptors and GIRK 1 and 2. Top right, response to a comparable application of quinpirole in a cell that has also been transfected with RGS 9L. Bottom left, comparison of the traces (top) scaled to a common amplitude to illustrate the difference in time course. Bottom right, effect of RGS 9L on the time constant of deactivation of the D2receptor-induced current. The time constant for the decay of the currents were significantly different (p < 0.02). Values are mean ± standard error from seven cells for control and eight cells for the RGS 9L. RGS proteins are a newly described class of signaling proteins that suppress the activity of G proteins by promoting their deactivation. The suppression of G protein-mediated signaling is achieved through the highly conserved RGS domain that directly interacts with G proteins and accelerates their GTPase activity (Tesmeret al., 1997). Outside of the conserved RGS domain, however, these proteins vary considerably in size and sequence. Furthermore, the domains flanking the RGS core seem to be critical for functional activity in vivo (Berman and Gilman, 1998). In this study, we report the cloning of RGS 9L, a large splice variant of RGS 9 that is highly expressed in forebrain regions receiving dopamine innervation. Both the large and small RGS 9 isoforms share common RGS and DEP domains. He et al. (1998) have shown that this domain in RGS 9 is sufficient to accelerate GTPase activity of Gt in biochemical analyses. The current work demonstrates that RGS 9L suppresses Gi-mediated signaling in transfected cells, probably by accelerating GTPase activity. The DEP domain is a recently recognized sequence found in several diverse signaling molecules (Ponting and Bork, 1996). Of the RGS proteins cloned to date, the DEP domain is found in egl 10, RGS 7, and RGS 9. Interestingly, these RGS subtypes seem to be expressed exclusively in the central nervous system. Although the function of the DEP domain is not clear, it is possible that this domain is involved in G protein functions, such as membrane excitability and secretion, that are unique to neuronal cells. The fundamental difference between the splice variants of RGS 9 is the presence or absence of a 200-amino acid motif that is enriched in proline and serine residues. Nothing is known about the functional significance of this domain; however, several observations suggest that it is likely to play an important role in modulating dopaminergic neurotransmission in the brain. Proline-rich motifs often serve as docking sites for the assembly of signal/protein complexes. Well-studied examples are proteins with SH3 and WW domains, which target and assemble signaling complexes through interactions with polyproline motifs (Lim et al., 1994; Staub and Rotlin, 1996). Furthermore, the strong, tissue-specific pattern of RGS 9 subtype expression is conserved between rats and human, suggesting that the polyproline motif is involved in G protein-mediated processes that are unique to striatal and hypothalamic neurons versus retinal photoreceptor cells and pinealocytes. 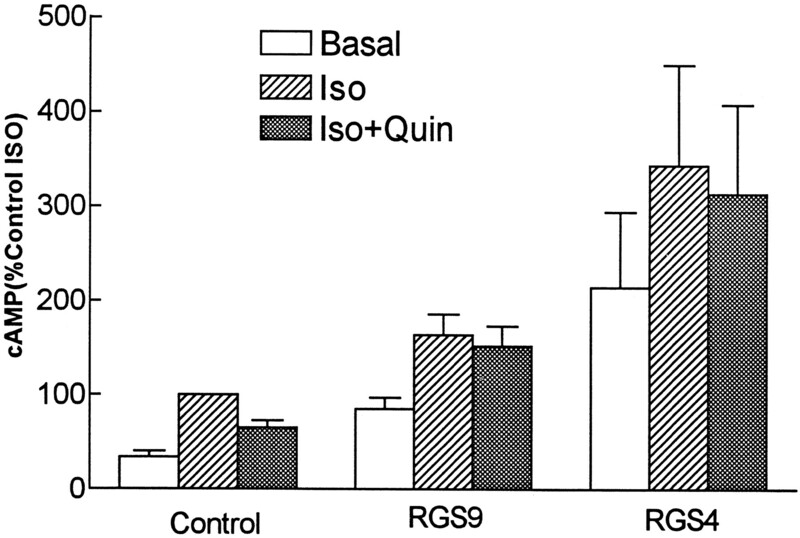 Work with recombinant RGS 9L indicates that it functions to suppress Gi-mediated inhibition of cAMP accumulation and GIRK activation. Whether the polyproline domain serves to more precisely target these functions in neurons is under investigation. In this regard, it has been noted that many proteins that associate with synaptic vesicles contain polyproline motifs (Linial, 1994). Clearly, an important goal of future work will be to define roles of the DEP and polyproline domains of RGS 9 in the organization and regulation of G protein signaling in vivo. 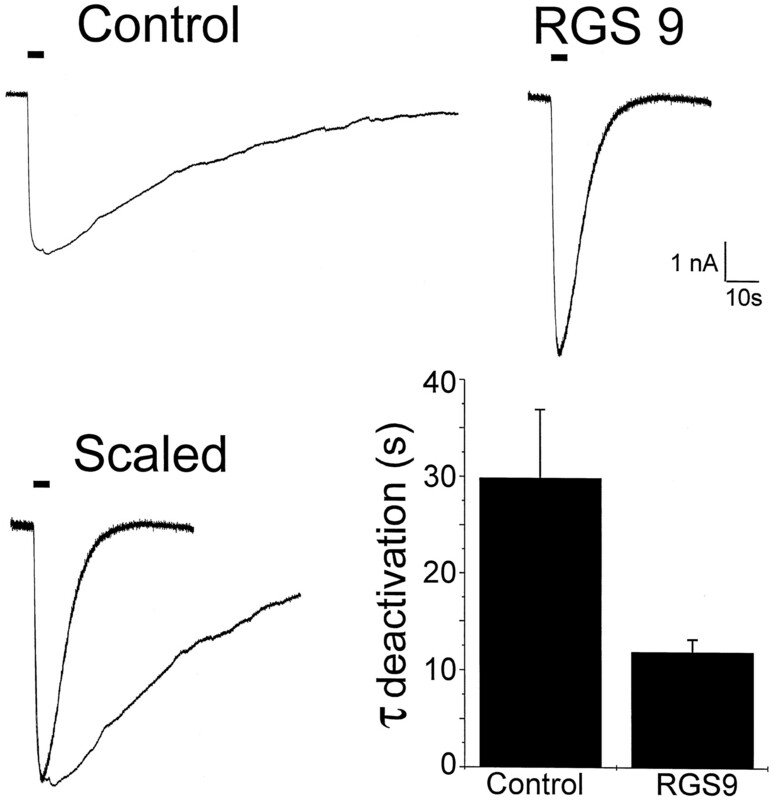 The current results demonstrate that RGS 9L affects Gs-mediated signaling by altering Gi-mediated suppression of this pathway. Preliminary in situ hybridization analyses indicate that RGS 9L is expressed in substance P-containing neurons in the striatum (Burchett SA, Granneman JG, and Bannon MJ, unpublished observations), which are known to express an abundance of D1dopamine receptors linked to Gs (LeMoine and Bloch, 1995). In this regard, we have found that release of dopamine by the indirect agonist amphetamine strongly suppresses RGS 9 expression in rat striatum (Burchett et al., 1998). Thus, inhibition of RGS 9 expression would augment the activity of Giproteins that oppose the D1/Gs pathway and thus serve as a means of suppressing D1-mediated neurotransmission. It is possible that the profound tolerance to dopamine-augmenting drugs such as amphetamine and cocaine seen after repeated administration could be related to alterations in RGS 9 expression or activity. The inhibition of Gs-mediated signaling through suppression of RGS proteins that interact with Gimay be a more general phenomenon because cAMP suppresses expression of RGS 4, a Gi GAP, in PC 12 cells (Pepperl et al., 1998). It is relevant to note that no RGS proteins have been shown to possess GTPase-activating activity with Gs, and it is possible that suppression of the expression, activity, or both of RGS proteins that interact with Gi is an important means of indirectly suppressing Gs-mediated signaling (at least with respect to cAMP-mediated signaling). In this regard, RGS 9 contains three consensus protein kinase A phosphorylation sites near the RGS domain that are conserved in all species examined to date. It is tempting to speculate that elevation of cAMP might acutely regulate RGS 9 function and provide a rapid means of suppressing Gs-mediated signaling. RGS 9L was also found to accelerate the decay of the dopamine D2 receptor-induced GIRK current in transfected CHO cells. This current is known to be activated by βγ subunits released from Gi (Kofuji et al., 1995;Reuveny et al., 1994). In contrast, we found no reduction in the amplitude of the current induced by dopamine D2 receptor activation after transfection of the cells with RGS 9L. Similar effects on dopamine D2and muscarinic M2 receptor-mediated GIRK currents also have been reported for RGS4 (Doupnik et al., 1997) and RGS8 (Saitoh et al., 1997). Previous studies in central neurons have shown that one of the clearest effects of dopamine acting on dopamine receptors of the D2 subtype is a membrane hyperpolarization mediated by the activation of inwardly rectifying potassium channels (Lacey et al., 1987, 1988). Because such currents are now understood to be mediated by channels composed of GIRK subunits, the current results suggest a possible effect of RGS 9L in the central nervous system might be to regulate the time course of potassium channel activation by dopamine D2 receptors. RGS 9 gene was localized to 17q23, very near the Whitehead marker WI-5110 and the Stanford marker SHGC-30967. Interestingly, the cGMP PDE γ subunit, which seems to interact with RGS 9S to accelerate Gt inactivation, also maps to this general region (Tuteja et al., 1990; Dollfus et al., 1993). Search of the Online Mendelian Inheritance in Man (OMIM) database ( http://www.ncbi.nlm.nih.gov/htbin-post/omim ) indicated that RGS 9 is within a 10-cM locus previously identified for retinitis pigmentosa (RP 17; Bardien et al., 1995, 1997). Furthermore, progressive rod-cone disease, a canine phenotypic equivalent of RP, recently was mapped to a region syntenic with 17q21–25 (Aclandet al., 1998). There are multiple loci for RP, but it is significant that mutations in genes in the rhodopsin/transducin/cGMP PDE signaling pathway have been shown to produce the disease (Dryja and Li, 1995). For example, activating and null mutations of rhodopsin produce RP (Rosenfeld et al., 1992; Robinson et al., 1992), as do mutations in the α and β subunits of cGMP PDE (McLaughlin et al., 1993; Huang et al., 1995). Furthermore, targeted disruption of murine cGMP PDE γ, a protein that seems to interact with RGS 9, results in a phenotype resembling RP (Tsang et al., 1996), although this subunit has been excluded as a cause of RP17 (Bardien et al., 1997). These observations suggest that either overactivity or underactivity of this G protein-mediated signaling pathway can lead to RP. RGS 9S seems to be an important regulator of the biochemical pathway that links rhodopsin to cGMP PDE. On the basis of its chromosomal localization, abundant expression in retina and biochemical properties, RGS 9 is a strong candidate for RP 17 in humans and progressive rod-cone disease in dogs. While undertaking our study, Thomas et al. (1998) reported a cDNA sequence for rat striatal RGS 9 that differs from the ones reported here. Compared with the rRGS 9L cDNA, the 5′ end of the sequence of Thomas et al. is truncated by ∼700 bp and thus lacks cDNA encoding the first 214 amino acids of rRGS 9L. Instead, the 5′ terminal 92 bp of the sequence of Thomas et al. contains consensus RNA splicing signals, including a polypyrimidine tract and an acceptor splice site, indicating the presence of an intron/exon boundary. Both sequences are identical immediately after the putative intron/exon boundary. Because Northern blots indicate that the size of RGS 9L mRNA is ∼2.5 kb (Gold et al., 1997; Burchettet al., 1998; current work), the 1749-bp cDNA obtained by Thomas et al. cannot represent the major mRNA species in the striatum. To further demonstrate this, we probed a Northern blot with a 5′ fragment of RGS 9L cDNA that does not exist in the sequence of Thomas et al. and found that it identifies the same 2.5-kb mRNA detected with the full-length probe (Granneman JG, unpublished observations). Moreover, antibodies to an epitope on the carboxyl terminus of RGS 9L that is common to both sequences detect a single band of ∼77 kDa, as predicted from translation of the current sequence (Granneman JG, unpublished observations). Together, these observations indicate that the cDNA described by Thomas et al. (1998) probably was derived from truncated, incompletely spliced mRNA. In summary, two RGS 9 subtypes are expressed in the central nervous system. RGS 9L is a novel splice variant that contains a novel proline-rich carboxyl-terminal domain and is abundantly expressed in forebrain regions receiving dopamine innervation. This isoform suppresses Gi function in transfected cells. RGS 9S is abundantly expressed in retina and pineal gland, and its demonstrated biochemical properties and chromosomal localization indicate it may be involved in degenerative retinal disease. We thank Donald Rao (Icogen, Seattle, WA) for the gift of the hypothalamic library, Robert MacKenzie (Parke Davis, Ann Arbor, MI) for RGS4 cDNA, H. A. Lester (California Institute of Technology, Pasadena, CA) for GIRK cDNAs, Archana Chaudhry (Wayne State University, Detroit, MI) for preliminary nuclease protection analysis, and Helena Kuivaneimi and Gerard Tromp for advice on genetic linkage analysis. Send reprint requests to: Dr. James Granneman, Cell Biology, Parke-Davis Research Labs, 2800 Plymouth Road, Ann Arbor, MI 48105. This work was supported by National Institutes of Health Grants DK46339 and DK37006 (J.G.G. ), DA06470 and NS34935 (M.J.B. ), and MH43985 (R.A.). (1998) Linkage analysis and comparative mapping of canine progressive rod-cone degeneration (prcd) establishes potential locus homology with retinitis pigmentosa (RP 17) in humans. Proc Natl Acad Sci USA 95:3048–3053. (1997) Age-related and regional differences in dopamine transporter mRNA expression in human midbrain. Neurology 48:969–977. (1995) An eighth locus for autosomal dominant retinitis pigmentosa is linked to chromosome 17q. Hum Mol Genet 4:1459–1462. (1997) Retinitis pigmentosa on 17q (RP 17): fine localization to 17q22 and exclusion of the PDEG and TIMP2 genes. Hum Genet 101:13–17. (1997) Developmental expression pattern of phototransduction components in mammalian pineal implies a light-sensing function. J Neurosci 17:8074–8082. (1995) Prevalence and clinical correlates of extrapyramidal signs and spontaneous dyskinesia in never-medicated schizophrenic patients. Am J Psychiatry 152:1724–1729. 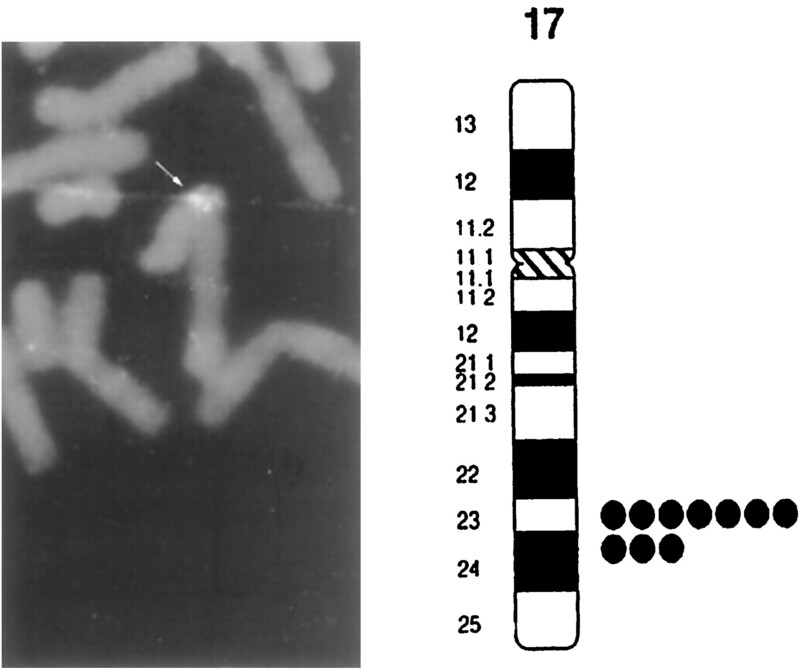 (1993) Physical and genetic localization of the gamma subunit of the cyclic GMP phosphodiesterase on the long arm of chromosome 17 (17q25). Genomics 17:526–528. (1997) RGS proteins reconstitute the rapid gating kinetics of Gβγ-activated inwardly rectifying K+ channels. Proc Natl Acad Sci USA 94:10461–10466. (1995) Molecular genetics of retinitis pigmentosa. Hum Mol Genet 4:1739–1743. (1998) Agonist interactions with chimeric and mutant β1- and β3-adrenergic receptors: involvement of the seventh transmembrane region in conferring subtype specificity. Mol Pharmacol 53:856–861. (1997) Selective upregulation of α1a-adrenergic receptor protein and mRNA in brown adipose tissue by neural and β3-adrenergic stimulation. Mol Pharmacol 51:644–650. (1992) High resolution mapping of mammalian genes by in situ hybridization to free chromatin. Proc Natl Acad Sci USA 89:9509–9513. (1993) Modes of DAPI banding and simultaneous in situ hybridization. Chromosoma 102:325–332. (1995) Autosomal recessive retinitis pigmentosa caused by mutations in the alpha subunit of rod cGMP phosphodiesterase. Nat Genet 11:468–471. (1995) Evidence that neuronal G-protein-gated inwardly rectifying K+ channels are activated by Gβγ subunits and function as heteromultimers. Proc Natl Acad Sci USA 92:6542–6546. (1987) Dopamine acts on D2 receptors to increase potassium conductance in neurones of the rat substantia nigra zona compacta. J Physiol (Lond) 392:397–416. (1988) On the potassium conductance increase activated by GABAB and dopamine D2 receptors in rat substantia nigra neurones. J Physiol (Lond) 401:437–453. (1994) Structural determinants of peptide-binding orientation and of sequence specificity in SH3 domains. Nature (Lond) 372:375–379. (1994) Proline clustering in proteins from synaptic vesicles. Neuroreport 5:2009–2015. (1993) Recessive mutations in the gene encoding the β-subunit of rod phosphodiesterase in patients with retinitis pigmentosa. Nat Genet 4:130–134. 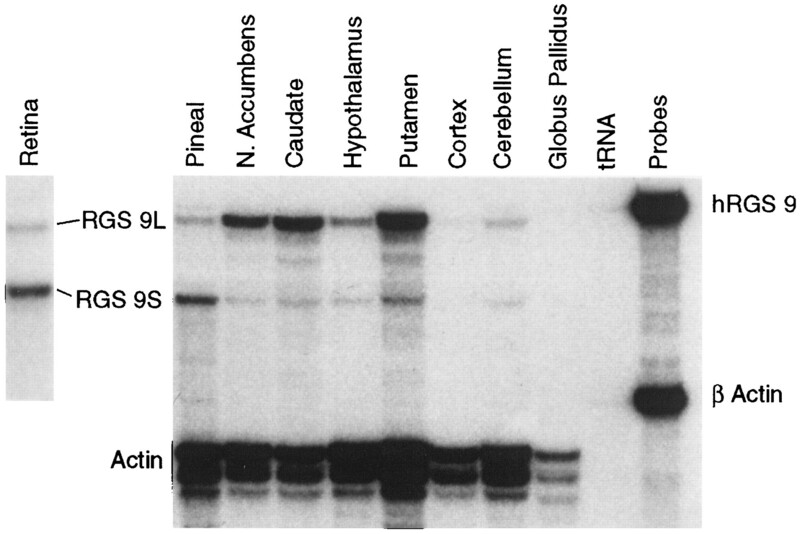 (1996) Pleckstrin’s repeat performance: a novel domain in G-protein signaling? Trends Biochem Sci 21:245–246. (1994) Activation of the cloned muscarinic potassium channel by G protein βγ subunits. Nature (Lond) 370:143–146. (1992) Constitutively active mutant of rhodopsin. Neuron 9:719–725. (1992) A null mutation in the rhodopsin gene causes rod photoreceptor dysfunction and autosomal recessive retinitis pigmentosa. Nat Genet 1:209–213. (1997) RGS8 accelerates G-protein-mediated modulation of K+ currents. Nature (Lond) 390:525–529. (1989) Molecular Cloning: A Laboratory Manual. (Cold Spring Harbor Labs, Cold Spring Harbor, NY). (1996) WW domains. Structure 4:495–499. (1997) Structure of RGS4 bound to AlF4-activated Giα: stabilization of the transition state for GTP hydrolysis. Cell 89:251–261. (1998) RGS9: a regulator of G-protein signalling with specific expression in the rat and mouse striatum. J Neurosci Res 52:118–124. (1996) Retinal degeneration in mice lacking the γ subunit of the rod cGMP phosphodiesterase. Science (Washington D C) 272:1026–1029. 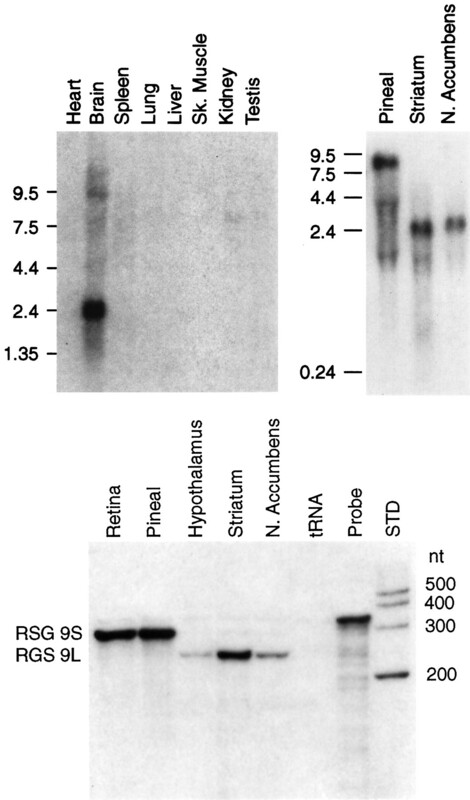 (1990) Isolation and characterization of the cDNA encoding the gamma-subunit of cGMP phosphodiesterase in human retina. Gene 88:227–232. (1996) RGS family members: GTPase-activating proteins for heterotrimeric G-protein α-subunits. Nature (Lond) 383:172–175. (1992) Rapidly progressive autosomal dominant parkinsonism and dementia with pallido-ponto-nigral degeneration. Ann Neurol 32:312–320.